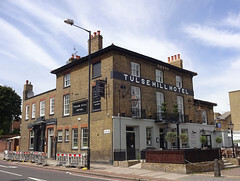 Pub in Tulse Hill. It's run by the Metropolitan Pub Company, which is part of Greene King. Entry is into a large but low-ceilinged area with the bar toward the back. Seating here is a mix of padded banquettes, high stools, padded benches at long tables, and high-backed armchairs. Past the bar is a dining area ready set with wine glasses and napkins, and beyond this is a pleasant garden. The decor is upmarket traditional, with varnished end-cut wooden tabletops above wrought-iron bases, plain walls, and a hardwood floor softened by worn patterned rugs here and there. Kake visited on a Thursday afternoon in August 2016. There were a handful of other customers in when I arrived around 2pm. Music was playing, not too loud. Service was friendly and chatty. Three of the five handpumps were on, offering Dark Star Sunburst, Hackney Brewery American Pale Ale, and Greene King IPA. According to the member of staff who served me, the regular ales are Greene King IPA and Ship Full Sail (brewed specially for the pub, also by Greene King). They also had keg taps for things including Estrella Damm, Bedlam Pilsner, and Truman's Roller IPA. A pint of lime and soda was a pleasingly-cheap 40p. According to their website as of August 2016, they do food all day including breakfast at actual breakfast time (Mon-Fri: 7am-10pm, Sat: 8am-10pm, Sun: 8am-11am and noon-9pm). It's fairly upmarket, with prices to match photo of menu as of August 2016. Accessibility: Step-free entrance via a ramp. Toilets are down a flight of stairs with a sturdy handrail on one side and a heavy door at the end; we're not sure if there's an accessible toilet anywhere on the ground floor. Last edited 2018-05-12 11:30:04 (version 4; diff). List all versions. Page last edited 2018-05-12 11:30:04 (version 4).